Under Armour stock has risen more than 1,000% over the past five years. Here's how it could go even higher. In the world of athletic apparel, there's arguably no bigger winner over the last several years than Under Armour (NYSE:UAA). The athletic apparel specialist is riding a wave of momentum following its stellar second-quarter report last month, which marked its 17th consecutive quarter of at least 20% top-line growth and sent shares up 15% in a single day. In fact, anyone who purchased Under Armour stock around this time five years ago has seen their investment increase tenfold, absolutely trouncing the returns of both Under Armour's competitors and the broader market. UA Total Return Price data by YCharts. First, consider the fact that Under Armour's international revenue grew an impressive 80% year over year last quarter. Even then, international markets still only generated revenue of around $51.6 million, or 8.5% of Under Armour's total second-quarter net sales of $609.6 million. For perspective, last quarter Nike (NYSE:NKE) achieved international sales of more than $3.7 billion -- yes, with a "b" -- representing 53% of its total $7.02 billion in global Nike brand revenue. And that's not because Nike is simply that dominant. Rather, it's because Under Armour is only now beginning to ramp up its capital expenditures to support international growth. That not only includes necessary investments for overseas supply chains and infrastructure, but also securing sponsorship deals with popular overseas names. That includes, for example, soccer teams like Cruz Azul and Toluca in Mexico, Colo-Colo in Chile, and England's Tottenham Hotspurs. If Under Armour can ultimately translate the success of its brand in North America to consumers overseas, executing on this opportunity alone could yield huge returns. But investors should also keep in mind that a huge piece of Nike's global success is its dominance in footwear. It makes sense, then, that Under Armour is fighting hard to grab market share with its own competing footwear offerings, which began just six years ago with the 2008 introduction of its line of cleated football trainers. Under Armour's footwear line has since expanded to virtually every other notable segment -- including basketball, baseball, soccer, lacrosse, sandals, hiking boots, and casual footwear -- and for the first six months of 2014 generated sales of $223 million. For reference, that's just short of the $239 million in footwear sales Under Armour saw for all of 2013. Once again, though, Nike currently remains the undisputed global footwear champion, generating footwear sales of $4.4 billion last quarter alone. But after Under Armour's second-quarter report last month, its founding CEO, Kevin Plank, made it clear he sees this as a challenge, stating, "We're still continuing to hunt down becoming the number one athletic footwear brand in the world." Finally, I think investors are underestimating the prospects for Under Armour's efforts in "connected fitness." Specifically, you might recall Under Armour surprising many investors last November when it spent $150 million to acquire fitness app specialist MapMyFitness. I wrote at the time, "[F]or Under Armour, this just isn't about the money over the short-term. Instead, it's about building brand loyalty by interfacing more closely with its target audience." What the MMF acquisition is teaching us about today's athletic consumer is way ahead of our expectations, and consumers are engaging with the platform at a level beyond what we anticipated ... More importantly, our acquisition of MMF has given us a platform to get deeper into the conversation with potential technology partners around the intersection of proactive health and wearable technologies. What's more, he says, MapMyFitness added over 1 million new users every month in the second quarter -- with one-third of its users outside the U.S. -- and is on pace to add 10 million new registered users in 2014. Any way you slice it, that's a huge number of people with whom Under Armour can now more effectively communicate its message. 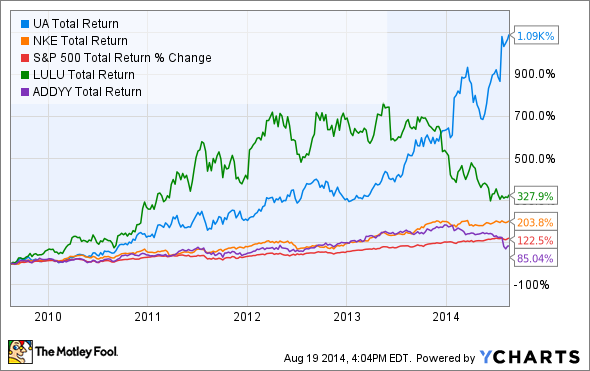 That's not to say Under Armour stock looks "cheap" based on traditional metrics. Shares currently trade at a premium of around 58 times next year's expected earnings, while analysts "only" expect it to grow earnings by roughly 19% annually over the next five years. At the same time, Under Armour has made a consistent habit of underpromising and overdelivering with each passing quarter, and shares of truly great growth companies like this seldom look inexpensive on the surface. For now, given the three reasons above, I'm convinced patient Under Armour investors still stand to be handsomely rewarded.